The Association of Southeast Asian Nations (ASEAN) was established on 8 August 1967 in Bangkok, Thailand, with the signing of the Bangkok Declaration by the Founding Fathers of ASEAN, namely Indonesia, Malaysia, Philippines, Singapore and Thailand. Brunei Darussalam then joined on 7 January 1984, Viet Nam on 28 July 1995, Lao PDR and Myanmar on 23 July 1997, and Cambodia on 30 April 1999, making up what is today referred to as the ASEAN Community – a regional inter-governmental organization that is set to promote economic, political, and security cooperation among its 10 member states. As such, ASEAN is built on three key pillars: the ASEAN Political-Security Community (APSC), the ASEAN Economic Community (AEC), and the ASEAN Socio-Cultural Community (ASCC). ASEAN is characterized by much diversity in terms of geography, demographics, economic development, political systems, and ultimately health outcomes. The quality and nature of health service delivery still varies considerably, as the health systems of ASEAN’s members states find themselves at varying stages of evolution towards the common goal of Universal Health Coverage (UHC). For instance, while Singapore has arguably the most developed and efficient healthcare system in the region, with the highest annual health spending on a per capita basis compared to its ASEAN peers, Myanmar as a lesser developed ASEAN country merely spends an average of 20 USD on healthcare for each of its citizens. The key financial constraints are low levels of government spending and overall spending on health. According to data estimates by the World Health Organization, average total healthcare expenditure per capita in ASEAN lies at 544 USD – about 4% of the GDP, which is below the average of developed countries. Most ASEAN countries allocated less than 5% of their GDP as expenditure on health in 2012, with the exception of Cambodia (5.4%) and Vietnam (6.6%). While levels of private spending on health are significantly higher than public spending, including a recent increase in public private partnerships to improve and expand health services, considerable barriers to investment in healthcare remain. Insufficient healthcare providers and unequal distribution of health professionals have remained a significant problem in most ASEAN countries. Most countries in the region suffer from a chronic shortage of nurses, midwives and doctors. For instance, the ratio of doctors to population ranged from two doctors per 10,000 population in Cambodia, Indonesia, and Lao PDR to 14 and 19 doctors per 10,000 population in Brunei and Singapore, respectively. 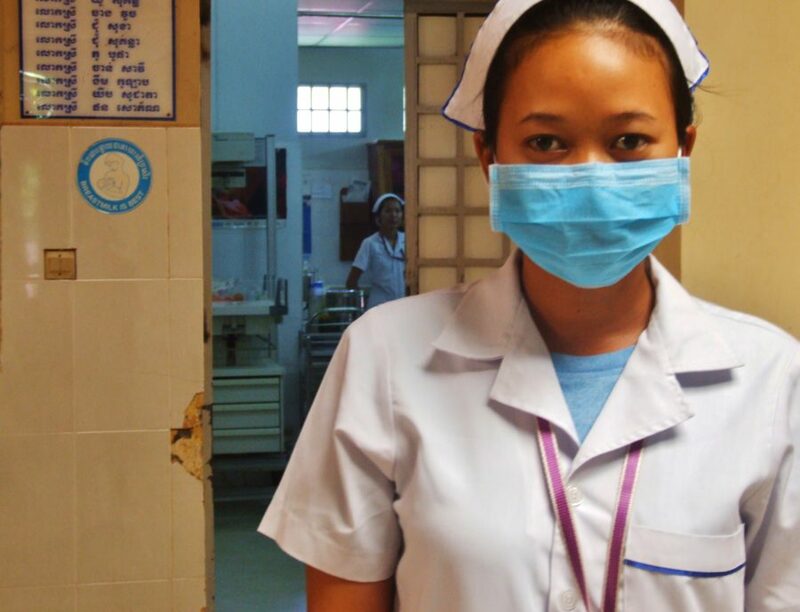 Moreover, recent research showed that all countries in Southeast Asia face problems of mal-distribution of health workers, where rural and remote areas are often understaffed. There is weak coordination between production of health workers and capacity for employment in most countries. In terms of epidemiological transition, ASEAN is challenged by a double disease burden that poses severe threats to its population: persistent and emerging infectious diseases with a potentially pandemic character coupled with increased morbidity and mortality from non-communicable diseases (NCDs). Especially NCDs are regarded as a major issue, as they are now responsible for 60% of deaths in the region, with problems mostly stemming from population ageing, changes in life-style (tobacco use, alcohol use, unhealthy diet, and inadequate physical activity) and environmental factors. In fact, the rise in healthcare consumption is putting ASEAN public healthcare systems under severe strain and the region’s fiscally-limited governments are fighting an uphill battle to meet their citizens’ growing healthcare needs. ASEAN leaders have identified and defined medical and health services as priority sectors under the current AEC Blueprint. In November 2004, the ASEAN Trade Ministers had already adopted a roadmap to promote trade in healthcare goods, such as pharmaceuticals and medical equipment. In addition, two service sub-sectors in the healthcare industry have been specifically targeted for progressive liberalization. Health services, on the one hand, covering hospital services and the services of medical laboratories, ambulances, and residential healthcare and services of medical professionals, on the other hand, including medical and dental professionals, midwives, nurses and physiotherapists. Bearing in mind the heterogeneity and the large size of the ASEAN health markets, greater regional economic integration will offer tremendous prospects for the healthcare industry. As ASEAN governments share the common goal of enhancing their healthcare systems in order to provide better quality services to their citizens, health services will most likely become more available in the face of increased trade liberalization. Yet, while the opening of healthcare markets promises substantial economic gains, it also intensifies existing challenges to promote equitable access to healthcare within countries. Services sector integration, in particular, presents the biggest challenges and opportunities for the region. Some ASEAN countries have already become significant exporters of modern services in the areas of professional services and information and communication technology (ICT). Medical tourism is a booming industry in Southeast Asia, with states like Singapore, Thailand and Malaysia among the world’s top destinations, where health services for wealthy foreigners from inside as well as outside ASEAN are combined with recreational packages to boost consumption. However, in light of ASEAN liberalization and in the midst of the overall expansion of private health providers and transnational healthcare companies, it is more important than ever that UHC is given explicit priority to safeguard access to health systems particularly among disadvantaged groups. For ASEAN countries, UHC should be explicitly considered to mitigate deleterious effects of economic integration. Political commitments to safeguard health budgets and increase health spending will be necessary given liberalization’s risks to health equity within and between ASEAN countries.